For todays daily Christmas decorations I want to share an evergreen with you. A little decoration that returns every year to my house. A sentimental little useless thing I always do and that makes me feel so close to my mother again. I shared it with you last year. I hope you don’t mind I share it with you this year too. 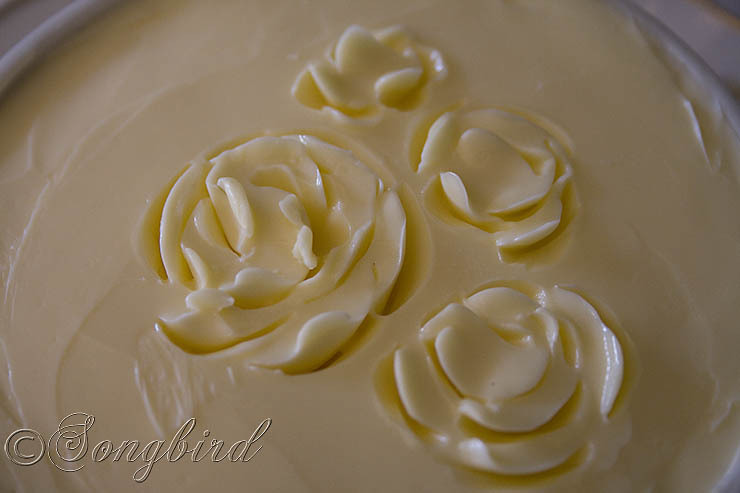 How to make Roses in your Butter. Christmas must be the time that is the most powerful in bringing back memories. So let me share some childhood memories of Christmases in the Netherlands with you and a neat trick to make your butter dish look extra special at your Christmas Breakfast table. We are going to make roses in your butter. The Christmases of my youth were filled with traditions. The way we decorated the tree, my mom’s center pieces with real greens from our garden, the traditional Christmas dinner, watching movies like Sissi every year, it all was so wonderfully familiar. But my most vivid memories of those early Christmases are about Christmas eve. Because Christmas didn’t start until after the midnight Christmas mass in the big basilica in my home town. The dark streets would be busy with people silently walking to church, the church would be filled to the brim with worshipers, the air heavy from the incense and I would wait for the organ to start playing the oh so familiar Christmas songs. Of course as a child I felt the high mass took forever, but at least all the Catholic rites gave me something to watch. After the mass we would meet up with friends and neighbors wishing them a merry Christmas and walk home through the cold and dark winter night, to what I thought was the best Christmas tradition of them all: the nightly Christmas breakfast. While my mother would be busy in the kitchen preparing food and drinks, my father would light the Christmas tree and candles and I (being the youngest that honor was mine) would place the baby Jesus in the crib. And with only the light of the Christmas tree and the candles we would sit down for a nightly breakfast of tea, warm sausage rolls and Christmas bread. Oh yeah and real butter…. Every year I looked forward to the moment the lid of the butter dish was lifted and I could see the roses in the butter. I am sure my mother must have cooked lavish and delicious Christmas dinners, but for me the essence of what made Christmas special was a butter dish with roses. I think I was only six when I learned how to make these roses and it was my ‘duty’ ever since to make them. And now still, when I set my Christmas breakfast table with my mother’s China, with white linens and red ribbons, just like my mother did, I’ll know there will be roses in my butter and the memories of childhood Christmases in my heart. Do you want roses in your butter too? First put the butter in a dish (it doesn’t have to be a real butter dish) and make sure the top is nice and even. Put the butter in the fridge for a few hours so it becomes hard and easier to work with. Select a tea spoon that has a bit of a pointy tip and put a small bowl with hot water nearby. Now with the tip of your spoon slice into the butter and bring it back up in a ever so slightly curvy move. It is hard to explain, but easy to do. Form little petals that way and make them bigger as you go with every row. Keep dipping your spoon in the hot water so it will slightly melt the butter. Just practice a bit and you or your daughter (or son) will soon have the hang of it. If it doesn’t work out the first time just flatten the butter again and start over. Make the rose as big as you want or add several to the dish. Finish up with ‘drawing’ a stem and leaves and a decoration on the side. Voila, Roses in your Butter! Love the roses! Beautiful post, table setting and memories! Beautiful! It's those little details that make things so special. I too used to go to midnight mass as a child and we would eat a meal upon our return to the house also, however it was my mother's meat pie, and fixings. I'm mostly vegetarian now, but will always make an exception for that tourtiere! Roses in the butter is simply charming. I love this idea. Thanks for sharing the memories. Ja, ik weet het nog hoor, toen vond ik het ook al zo leuk! Heerlijke herinneringen aan kerst… Het blijft toch een hele speciale tijd hè! En weet je, toevallig heb ik me onlangs eens een beetje verdiept in the 12 days of Cristmas (had er nl geen flauw idee van) en het zijn officieel de 12 dagen na kerst tot in januari dus, de 6e als ik het goed heb. En elke dag wordt er iets herdacht. Daar had ik echt geen idee van. Vind dit een superleuk initiatief! Zo probeer ik nu de hele maand december m'n December Daily bij te houden, ben benieuwd of ik het volhoud! Your butter roses are so pretty and simple to do! Lovely dinner ware too. Oh that was cute! I have never heard of that in sweden, though I know they displayed the butter in a fancy way on the table. I love the Sissi movie it's a typical princess dream. But I've only seen the first one. I also have the book with wonderful illustrations. I am definitely putting roses in my butter this year. Thanks for the inspiration! Beautiful post! Made me think of my mother and her traditions. So special. I am definitely having roses in my butter on Christmas day and I am putting it in one of my mother's dishes. I cannot express just how much I enjoyed your post. I am not Dutch, but Dutch traditions have touched my life and your mention of sausage rolls brought back nice Christmas memories for me too (my brother lived many years in a Michigan Dutch community and introduced them to our family). My husband and I celebrate St. Nicholas Day with our little girl much like you do with Sinterklass, keeping Christmas and the good saint's giving separate. Thank you again for this wonderful sharing of traditions, and enjoy your coming celebration with Sinterklass.